Who knew supplementing with CBD could be this easy? Hemp Honey is so versatile. A soothing skin serum, cloud worthy vape, and even an edible tincture. Hemp Honey uses only CO2 extracted CBD Rich Hemp Oil, pure USP grade Vegetable Glycerin, and natural and organic flavorings. Each flavor has its own complex flavor profile that complements your favorite food and drink. Naturally sweet VG pairs with the tangy fruits and warm spice flavor profiles of Hemp Honey Liquid to create a tasty treat. 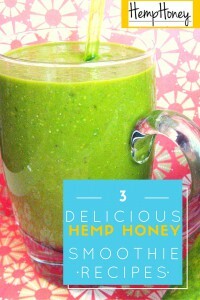 Easily capitalize on the benefits of Hemp Honey by incorporating it into your daily smoothie! It is so easy! Hemp Honey is the perfect antioxidant booster for your health food regimen. Below you will find three easy recipes to incorporate Hemp Honey Liquid into your diet. But these recipes are only a starting point! Let your imagination run wild. A dense, fruity smoothie that harnesses the power of apples, pear, and Hemp Honey Apple Crumble. Pour apple juice into blender. Top with pear, apple, spinach, cinnamon, ice, and Hemp Honey. Blend until smooth. So many fruits! Plus a little bit of spinach for some green goodness. Hemp Honey Bumble Gum gives just the right amount of oomph to this vitamin-packed blend. Add all ingredients to blender and whip until smooth. Makes a delicious and healthy smoothie, teeming with nutrients and a fruity bubble gum flavor! Creamy yogurt, tangy blueberries, and Hemp Honey Blueberry Hive – a winning combination. Easy to make in the blender in only a few minutes! Add all ingredients to blender and whip until smooth. This smoothie will be thick and creamy because of all the frozen ingredients. Top off with a few leftover blueberries and serve.